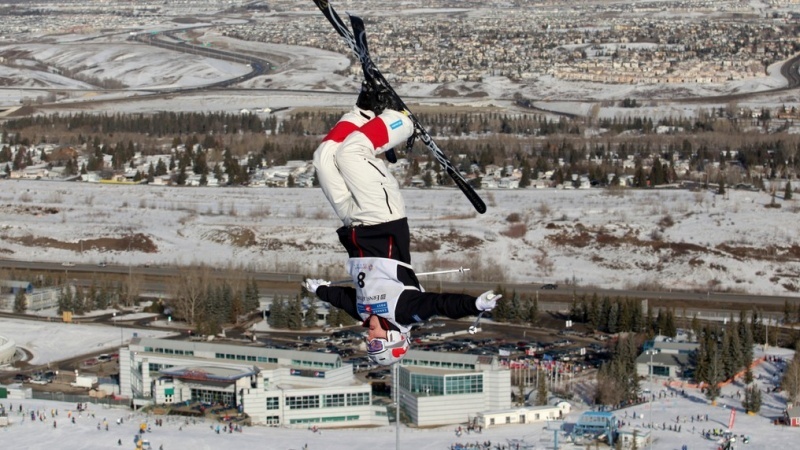 Calgary (AB), Canada – There will be no shortage of exciting freestyle skiing competition to watch when the FIS World Cup stops at Calgary’s Olympic Park for its annual moguls event this Saturday. A total of 19 Canadians will be competing (10 men and nine women). Leading the way for the men will be Mikael Kingsbury, of Deux-Montagnes, Quebec, who will be entering the competition as the Calgary tour stop’s four-time defending champion. At last season’s Calgary World Cup, Justine Dufour-Lapointe of Montreal grabbed first place on the podium and sister Chloe finished in third. Not far off were Andi Naude (Penticton, B.C.) in fourth and Maxime Dufour-Lapointe (Montreal, Quebec) in fifth. Justine’s win marked her second consecutive victory in Calgary and her third podium overall. Canada will also have the current FIS World Cup points leader competing in Philippe Marquis of Quebec City, who earned the yellow bib with his dual moguls World Cup win in Ruka, Finland December 13. Members of Canada’s moguls team will be available on skis to meet with members of the general public from 10 a.m. to 2 p.m. at WinSport’s Canada Olympic Park. Athletes will be interacting with fans, giving out autographs and posing for pictures.